Mijello Ellipse Peel-off Palettes are ideal for all media, but their high-impact, non-porous plastic construction makes them particularly suitable for acrylics and oils. Dried paint (even acrylic!) 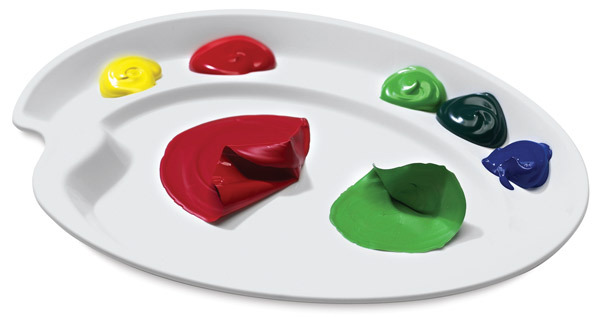 peels away almost like magic, providing you with a clean, fresh palette for every painting session. These generously sized palettes are ergonomic in design and can be used by either right- or left-handed artists. A deep central well provides a large, uninterrupted area for color mixing, and there is a shallow perimeter band that can be used for smaller portions of color.